We are suppliers of any cork product for the angling trade. We do not supply private individuals. Any products can be supplied to customers own specification providing there are sufficient quantities (to make the price economical). 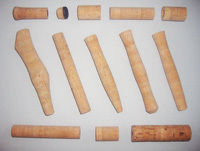 This is our main business and our customers include UK based, European and worldwide firms, so send us the details with a sketch of the cork handles you require and we will quickly respond with a competitive price in the grade of cork you need. We also offer the same service in handles made-to-your-specification in standard black DUPLON EVA, which is a much cheaper than cork. Once again – please send us a sketch with main dimensions of the handles you require. Please contact by phone, fax or e-mail for prices, further information and samples if appropriate or any other size you require.